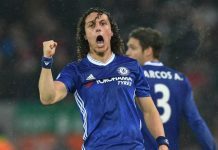 On Saturday evening, Chelsea welcome Stoke City to Stamford Bridge in hopes of stemming the tide of a mini-crisis while also getting revenge for the defeat in the league earlier this season at the Britannia Stadium. If Stoke were to pick a time to play the Blues, this would either come as the best time to play them or the worst time. 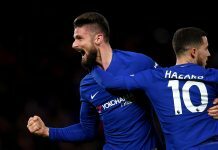 The Potters will either believe that Chelsea are a wounded animal, coming off of two dreadful defeats back-to-back, and could be made very nervous at Stamford Bridge, or they can look at this team as an angry, wounded animal ready to set things right and pounce on a team that doesn’t have the same quality. Jose Mourinho will hope that the latter is the response he gets after his Chelsea side looked quite toothless over the last two matches. His strikers have borne the brunt of his fury, but the normally reliable Chelsea defence has let him down over the last two matches, having their performances summed up very nicely by a viewing of Javier Pastore waltzing through the back line unchallenged. On the Stoke side, Mark Hughes main job will be to make sure that his team is still up for the last 6 matches of the season. A 5-match unbeaten run with 3 wins has garnered enough points that the Potters will be in the Premier League next season. The trick is now to have them focused and ready to play these matches as a platform to build on for next season. Stoke City are not quite the bullish, brutish side that they were under Tony Pulis and that we saw early in the season. To Mark Hughes’ great credit, he’s found a way to transform his Stoke side from the strong, forceful, borderline-bullying side that he inherited into a side that doesn’t lack desire, commitment, and bravery, but are still able to play nice passes. The two chief beneficiaries of this adaptation have been Charlie Adam and Peter Crouch. While the former fit very well into the old Stoke City mould, it’s worth noting that he had always been regarded as a very good passer of the ball from his time at Blackpool where Ian Holloway had basically built the midfield around his abilities. That was the reason that Liverpool bought him in the first place, but it was his willingness to put in a tough challenge that simultaneously attracted Stoke City’s attention while also ensuring that his services were no longer needed at Anfield. Now under Hughes, the ball-playing and newfound scoring abilities of Adam have come to life, and he’s once again the lynchpin of a midfield, however one that has been missing due to the prior willingness to engage in rough play coming out. He is quite dangerous and has given a nice balance to that midfield of Stoke. Crouch, on the other hand, is actually finding life a bit easier. Rather than simply being the tall guy having balls launched at him to knock down (though he still is asked to do that) he’s being allowed to have the ball played into his feet. Despite his height, Crouch has always played like he’s about a foot shorter and has always been good at scoring goals with anything but his head. He’s returned 9 goals this season, and as of late, has started showing some more of that side of his game than Stoke have often brought out of him in the past. What will the Blues mental state be upon returning from Paris? The defeat to Crystal Palace was bad enough considering that everyone on the planet knew that a Tony Pulis-coached side was going to defend deep, throw themselves at the ball, close everything down, and break on the counter. Okay, he didn’t show it a lot when he was the Stoke manager, but it was something that was completely effective as bodies were pushed forward. What will hurt worse is the fact that on Wednesday night, Paris Saint-Germain didn’t beat Chelsea 3-1. Chelsea beat Chelsea 3-1. The fact is that all three goals that were conceded were easily preventable and were a conglomeration of mental errors, lack of focus, or sometimes blatant stupidity (enter David Luiz’s give away of a free kick before the own goal). Not only that, but Mourinho has again publicly come out and criticized his strikers, left Fernando Torres and Demba Ba on the bench, and played a winger through the middle where he looked like a winger being asked to play as a striker. Regardless of what he says, the title isn’t completely out of the picture, but points are needed if we want to even have a shot and, most importantly, if we want to avoid falling down to fourth and having to play a qualifier to get in. This is the time you would expect a Mourinho-managed squad to respond by giving a top-notch performance, stave off the knife-wielding critics, and give yourself some momentum going into the second leg against PSG on Tuesday. The actual response we see on the pitch will go a long way to finding out if the squad mentality is getting closer to the one Mourinho wants. Will the Stoke players be eyeing up their travel plans for the summer already? Let’s go back in time and see what the scenario was around the reverse fixture in December. Going into the eventual 3-2 win for the Potters at the Brittania Stadium, Stoke had just 14 points from 14 games, had won just 3 while drawing 5 and losing 6, sat in 16th place, and talk was whether or not Mark Hughes was going to be the man overseeing the downfall of another Premier League club. 18 matches later, Stoke have amassed a total of 40 points, basically assuring themselves safety this season, and have taken 26 points in those 18 matches. Quite simply, it’s been a massive improvement in form, and they’ve been playing well. But, much like the team just above them in the table, they are very safe, and we’ve seen Newcastle look as if they were already sitting on a beach somewhere sunny and enjoying their holidays. Stoke are very much in that situation now given their run of 3 wins and 5 matches unbeaten. Will they find it hard in a match against a Chelsea side who aren’t in good form when they don’t need the points, or will they look at a wounded animal and a chance to claim another big scalp, as they have done all season? Can Stoke once again exploit Chelsea’s main weakness in their back line — pace? The one thing that John Terry and Gary Cahill have shown a weakness to this season is pace, but it’s largely been covered by a few things. The introduction of Cesar Azpilicueta to left back has given them a player with a little more strength and equal pace to Ashley Cole, and he’s been able to nullify problems like Oussama Assaidi gave them in the first matchup. As a secondary measure, Mourinho has started to deploy his holding midfielders in deeper positions to protect the center backs, which has been aided by the arrival of Nemanja Matic (which may be why Frank Lampard finds himself on the bench lately). PSG reopened that weakness on Tuesday night with the attacks of Ezequiel Lavezzi and Lucas Moura. That introduction of pace, along with the substitution of Andre Schuerlle, changed that match, and Stoke do have the players that can cause problems. While Jonathan Walters isn’t necessarily of that class, he is quick enough, and he has given Chelsea problems in the past with his physical abilities, quickness, and drive to make things happen. He returns from his 3-match ban for his sending off against Norwich, but luckily, Assaidi is unlikely to play due to injury.